American Crane & Equipment Corporation offers standardized Low Headroom Built Up Hoisting Machinery meeting Class D and E requirements. American Crane and Equipment Corporation offers standardized industrial hoist machinery which meets Class D and E requirements. All equipment is designed per CMAA Specification #70, Revised 2004. Certification is available upon request. 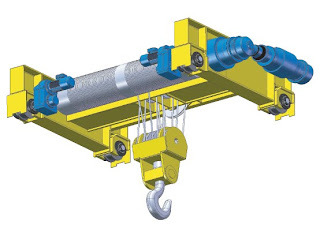 The Built Up Hoist is available in capacities up to 1000 Tons and is designed for high speed and heavy duty service. The hoist features the following: quality components, Magnetek (Electromotive) AFD Controls, hardened steel sheaves, and double grooved drum for true vertical lift. Optional features include hardened drum grooves, power circuit paddle limit, redundant holding brake, redundant drum brake, overload limiter and full quality assurance documentation. For more Hoisting Machinery information click here. Visit our homepage to find out more about all our products and services. Call us with any questions at 1-877-877-6778 or email us at sales@americancrane.com.